I AM IN THE PROCESS OF UPLOADING DIFFERENT ITEMS TO THIS PAGE. I AM OFFERING FOR SALE 4 OF MY OWN BIKES, 3 OF WHICH HAVE NEVER BEEN RIDDEN. 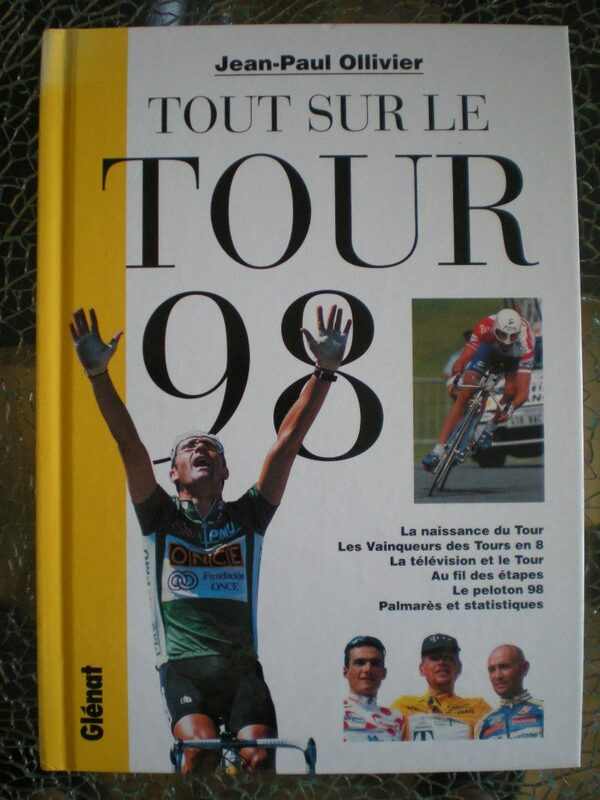 WHEN COMPLETED, IT WILL LIST BOOKS, POSTERS, NUMEROUS FRENCH CYCLING MAGS: MIROIR SPRINT, MIROIR DU CYCLISME ETC PLUS A UNIQUE COLLECTION OF 68 VARIOUS MAGS ALL OF WHICH COVER THE RESULT OF PARIS-ROUBAIX, EARLIEST ISSUE IS 1921!! 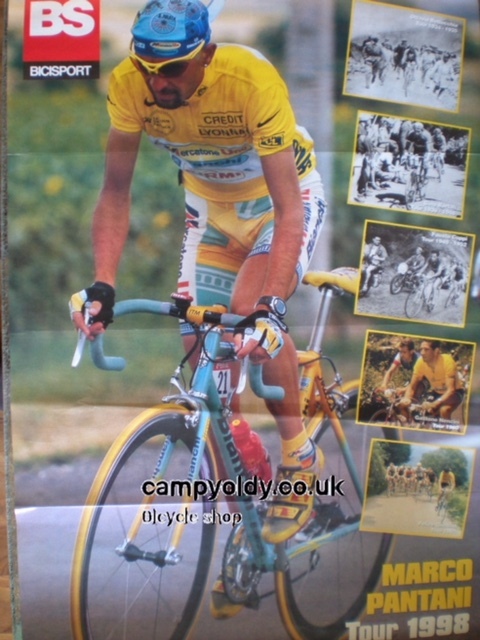 THE SECOND LIST CONTAINS 68 FRENCH MAGS COVERING THE RELEVANT YEAR’S RESULT OF PARIS-ROUBAIX. 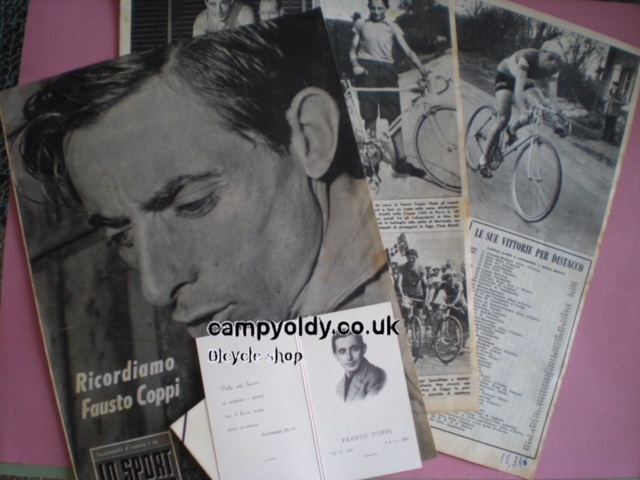 WHILST EVERY YEAR HAS OUTSTANDING PHOTOS & A WONDERFUL STORY TO TELL, I HAVE NOTED 1950 COPPI 1st AND 1964 PETER POST 1st. 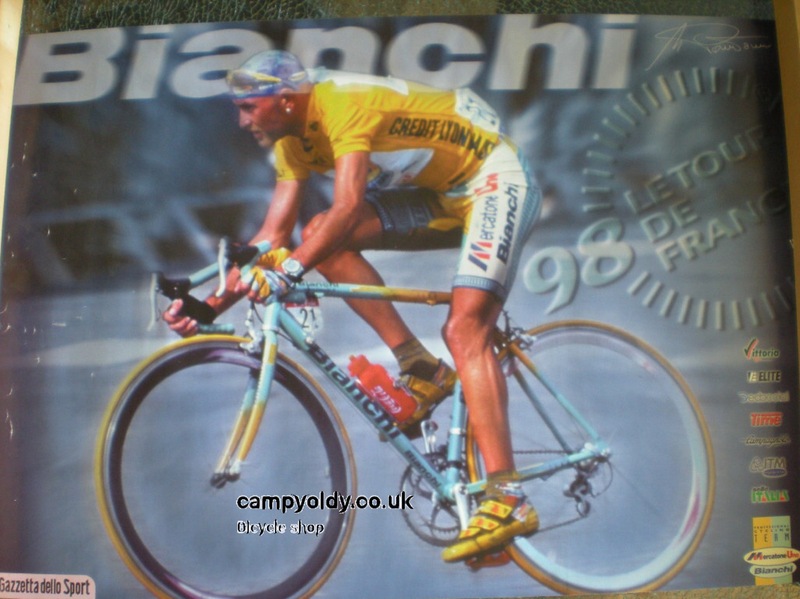 THE 1969 WINNER WALTER GODEFROOT HAS AUTOGRAPHED THE FRONT COVER – I ASSURE YOU IT IS GENUINE, I APPROACHED HIM DURING 1994 TdF STAGE FINISH. 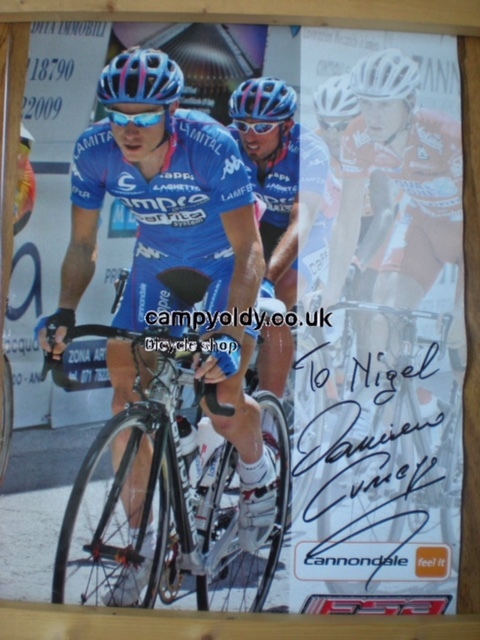 LIKEWISE 1972 WINNER ROGER de VLAEMINCK SIGNED THE COVER WHEN HE CAME TO UK 20+ YEARS AGO TO RIDE A SPORTIVE NEAR BOURNEMOUTH. 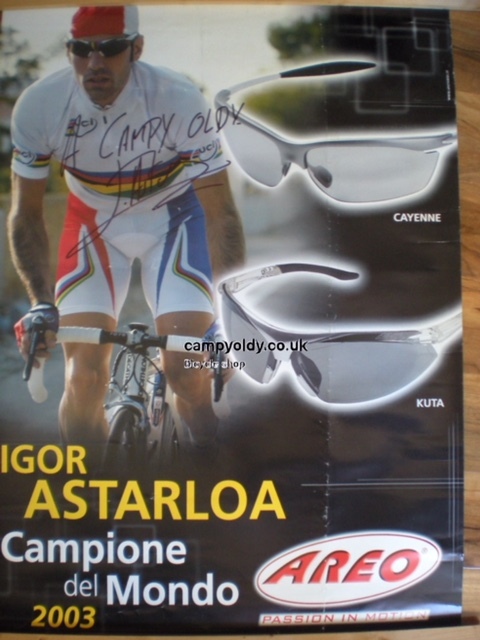 3 TIMES WINNER FRANCESCO MOSER HAS SIGNED A DOUBLE PAGE PHOTO IN MdC 1980. CLICK ON LINK FOR DETAILED LIST. 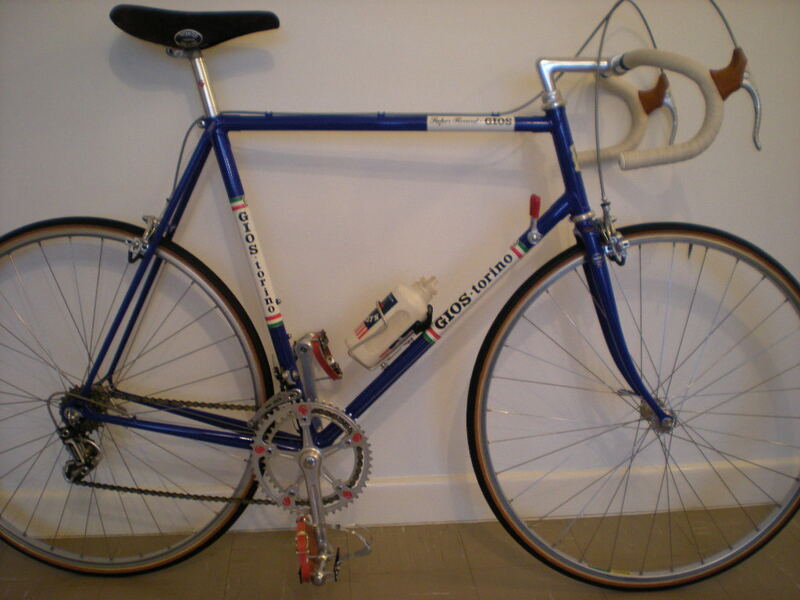 GIOS SUPER RECORD FRAME #10 OF 100 which they re-produced in 2003 25 years after its introduction, 60cm centre-top. 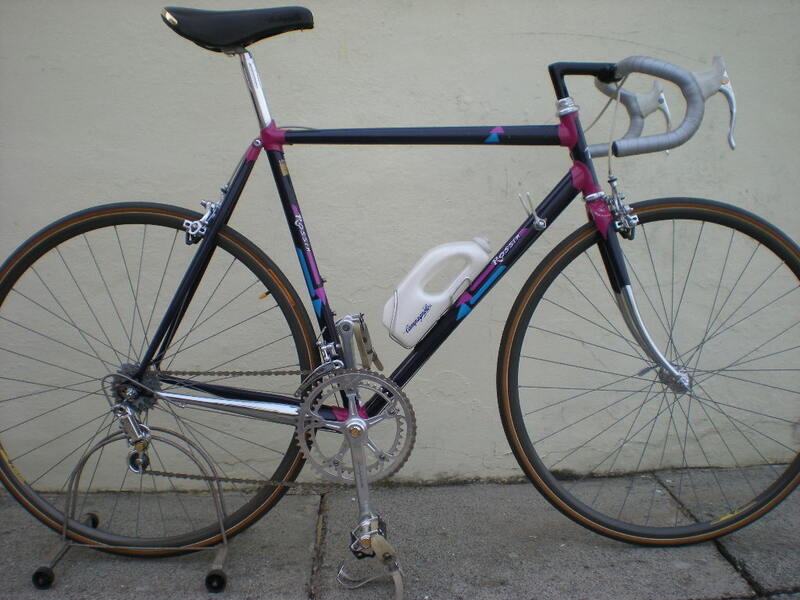 I bought the frame at Milan Show 2003 and built it up with NOS Campagnolo Super Record group, Cinelli 1/R stem, old logo bars, leather covered Unica, Regina ORO freewheel & chain, even an original Brooklyn bottle. 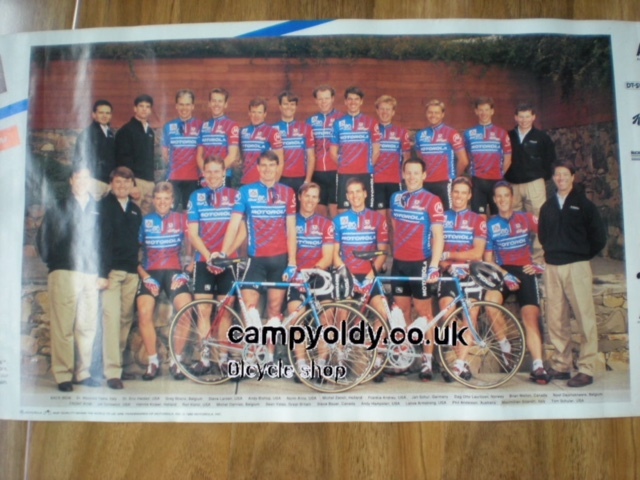 It was featured in CycleSport mag May 2004 following a previous issue write-up on Roger de Vlaeminck. 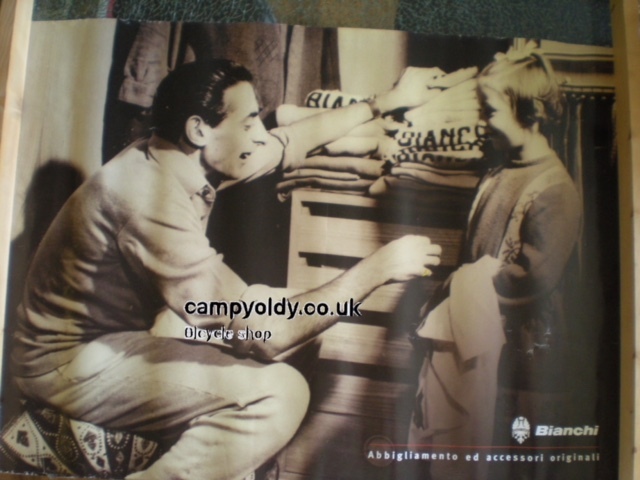 I took a copy of the mag back to Milan Show 2004 and Alfredo Gios signed it plus the original catalogue are included. Again, like a lot of my bikes – never been ridden. 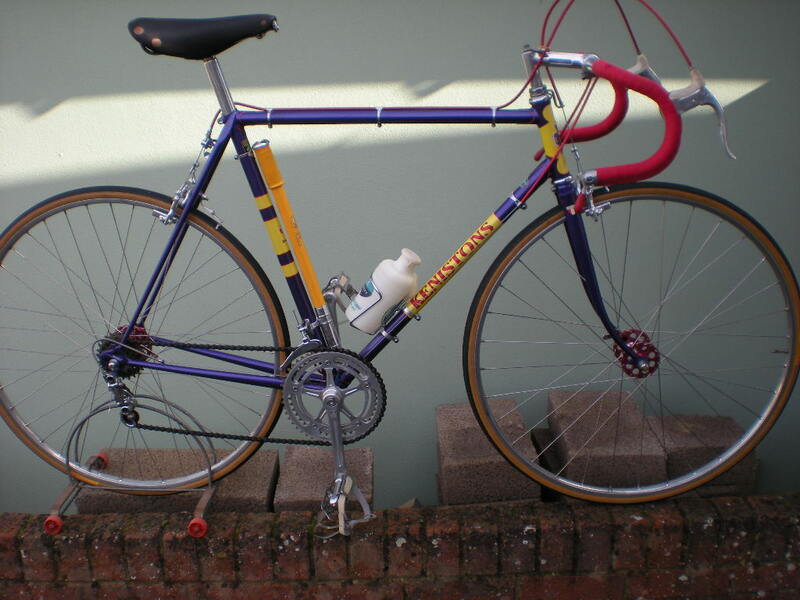 ROSSIN FRAME OF COLUMBUS MAX TUBING EQUIPPED WITH CAMPAGNOLO 50th ANNIVERSARY GROUP BUT…CHECK THE BRAKE LEVERS! They have the engraved handles & gold emblem of the Cinquantenario gruppo but have been modified for aero cable route. It has never been ridden, the seatpost position appears ridiculous but it has not been inserted beyond the Limit line. Campa 7sp freewheel, Electa saddle, Biodinamica bottle, ITM bars & stem, Wolber rims. The gruppo has a high number and the levers mod. must have been a Campa factory job as the little rollers are mounted on a tiny spindle pressed into the handles. MAX tubing was late 1980s? Stamped 56 under BB = from lowest point of seatlug to centre of BB. 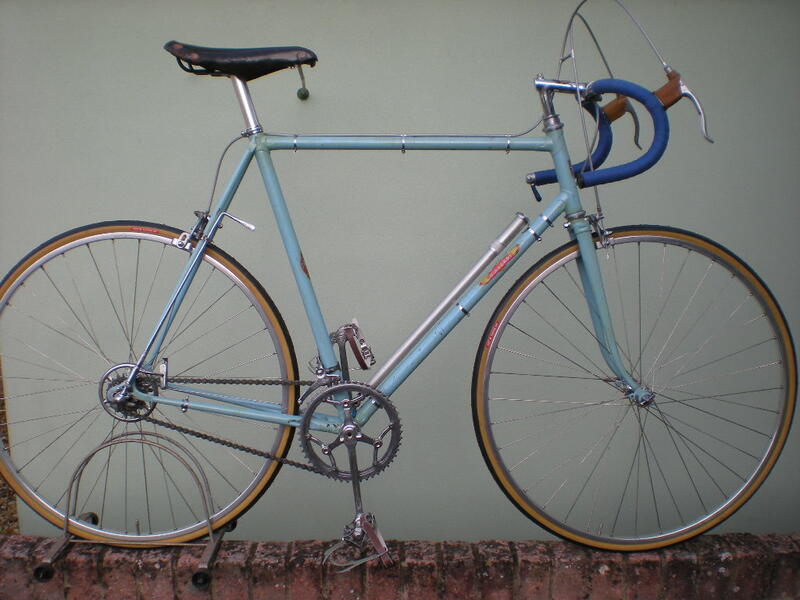 54cm c-c. Repeat – never ridden, this was a Rossin Show Bike and was wheeled out from an office, not cast aside in the warehouse. 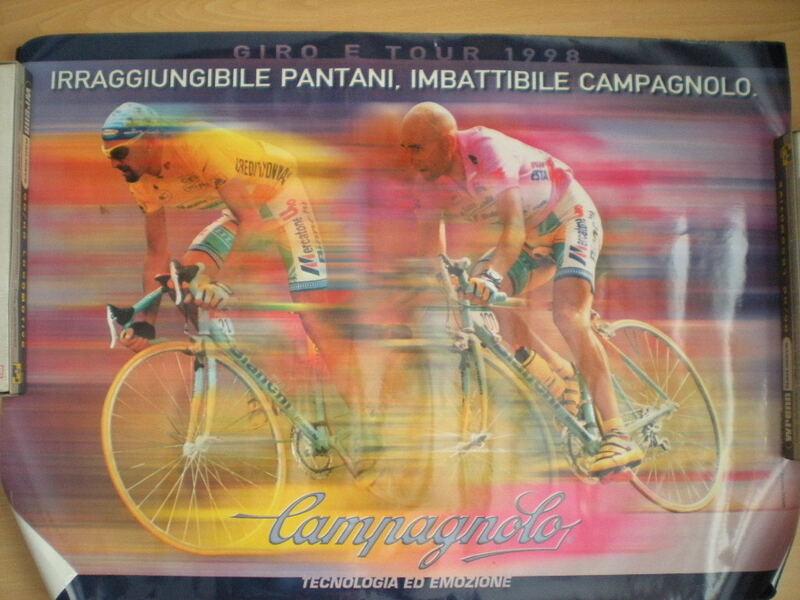 POSTERS: SIZES QUOTED IN mm, CONDITION OF ANYTHING IS SUBJECTIVE BUT GOOD MEANS NOT TORN. CREASES NOTED, THATS WHAT HAPPENS WHEN BROUGHT HOME IN A SUITCASE. 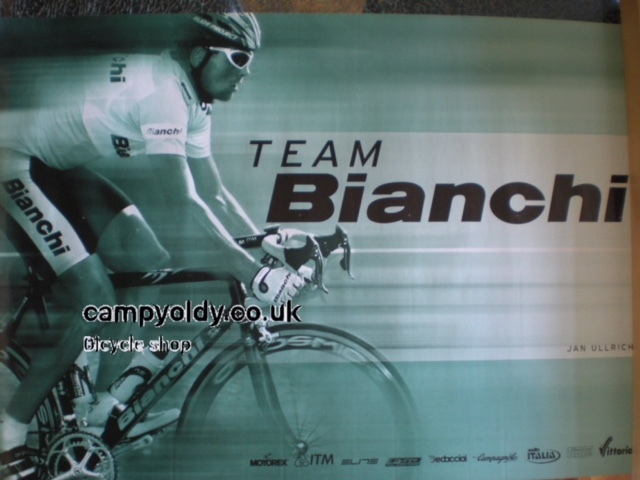 campyoldy.co.uk is a watermark on the photo to dissuade those who might copy and print them off. 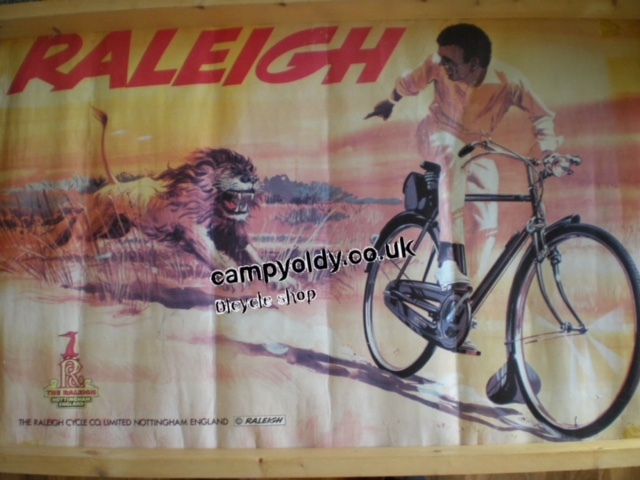 It is not of course on the actual poster. I will mail them rolled in a cardboard tube.